LEDGlow’s Advanced Million Color SMD Lighting Kit with Smartphone Control is the next generation of motorcycle LED lighting by offering total LED control directly from the palm of your hand. 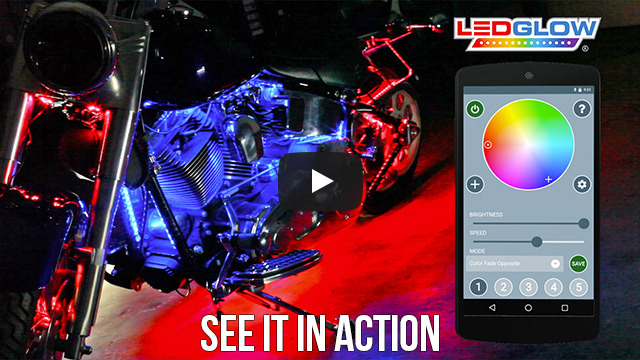 LEDGlow’s Advanced Million Color SMD Lighting Kit with Smartphone Control is the next generation of motorcycle LED lighting by offering total LED control directly from the palm of your hand. This motorcycle LED lighting kit features ultra-bright surface mounted RGB LED technology which produces extremely bright colors for a custom style plus added visibility when riding at night. The Advanced Million Color SMD Lighting Kit is available in a 6pc base kit all the way up to a 30pc kit. Each motorcycle LED light strip features 4' of power wiring. The included Bluetooth control box is the most powerful on the market by allowing users to install up to 1,000 SMD LEDs for maximum brightness regardless of the size of the motorcycle. Download and install the LEDGlow Mobile Control App to customize the look and style of any motorcycle with a few swipes of an iOS or Android device. Each control box is filled with a black epoxy potting material which encapsulates all the controls and circuit boards, making the control box completely waterproof. This control box will easily hold up to a ride in the rain and any other moisture exposure. The LEDGlow Motorcycle Control App allows full control of the featured colors and lighting patterns directly from an iOS (7.0 & up) or Android device (4.4 & up). Select virtually any solid color via the integrated color wheel and choose from 15 unique lighting patterns from the mode dropdown menu. Save up to 5 favorite customized colors and patterns for quick and easy recall using the in-app presets. With a few swipes of the sliders, adjust the brightness levels and speed intensity of the lighting patterns. The dual zone control feature allows even further color and lighting pattern customization by independently illuminating 2 sections of the motorcycle simultaneously. Each zone has the ability to power 500 SMD LEDs for maximum brightness. With an unlimited color selection and 10 unique lighting patterns, creative lighting options are truly endless. An additional 6pc power harness is included to utilize this feature. The automatic brake light feature illuminates all installed LEDs in red mirroring the motorcycle’s brake lights, safely signaling other motorists on the road. Pull the brake handle and the brake light feature automatically illuminates red LEDs throughout the bike. This feature can be used whether the control box is powered on or off. There are 2 different types of brake light features available in the app: brake light and brake pulse. Brake light illuminates all LEDs in solid red; brake pulse automatically strobes red LEDs into a solid color mode. To use this function, install the blue wire from the control box into the motorcycle’s brake signal wires. The hazard lights feature automatically overrides any color or pattern and flashes amber LEDs alerting other motorists on the road. The app features a first-of-its-kind low voltage shut off setting that helps conserve the life of the motorcycle’s battery. This feature automatically shuts the light kit off when the motorcycle’s battery voltage reads less than 10 volts for more than 60 seconds. The 2 included wireless remotes are also included as an alternate control option. The wireless remote features 4 buttons that select color options, lighting patterns, brightness/speed levels and dual zone control. The operating range of the wireless remote is 30’. Easily pair any compatible iOS or Android smartphone to the control box through a secure, Bluetooth 4.0 Low Energy connection. Using Bluetooth 4.0 LE technology greatly reduces power consumption while maintaining a secure point-to-point communication range. Bluetooth technology also allows for a quick and easy automatic connection whenever the device is in range of the control box without having to re-pair the device to the control box. I can’t believe the lighting the colors and how easily it was to install. What can I say!? I was looking for some LED lights to add to my 2012 GL1800, and LED GLOW had me covered. They had the controller and easy strips to lay everywhere on my bike. I had to do some cable management since I was using over 20 of the lights, but it paid off. The bike looks amazing. I will keep on adding lights as I see necessary. The add on upgrade parts make it easy to add on to my kit easily and affordably at any time. Installed on my Honda CBR500R 2016, it works as advertised. Support is great and responsive. One thing I would like to see is if possible to upgrade the smartphone app so that we can select a different break light LED color for each channel. Currently all lights go red upon pressing the breaks - not desirable for the front lights (front zone in my installation) as I am confusing the drivers in front of me, thinking that I am a policeman. In my opinion only the rear (and side) facing lights should be in red color but the front lights should be something else and not red and pulsing. For now I had to turn off the brake pulsing but if this feature ever gets developed then I will turn it back on for the rear zone. Hope the developers can program it ASAP as I already love this product.